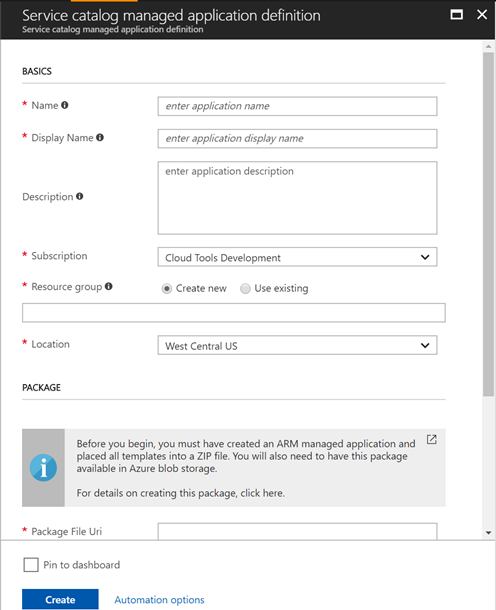 Today we are pleased to announce the general availability of Azure Managed Applications Service Catalog. Service Catalog allows corporate central IT teams to create and manage a catalog of solutions and applications to be used by employees in that organization. It enables organizations to centrally manage the approved solutions and ensure compliance. It enables the end customers, or in this case, the employees of an organization, to easily discover the list of approved solutions. They can consume these solutions without having to worry about learning how the solution works in order to service, upgrade or manage it. All this is taken care of by the central IT team which published and owns the solution. In this post, we will walkthrough the new capabilities that have been added to the Managed Applications and how it improves the overall experience. We have made improvements to the overall experience and made authoring much easier and straight forward. Some of the major improvements are described below. In the preview version, the publisher needed to author three files and package them in a zip. One of them was a template file which contained only the Microsoft.Solutions/appliances resource. The publisher also had to specify all of the actual parameters needed for the deployment of the actual resources in this template file again. This was in addition to these parameters already being specified in the other template file. Although this was needed, it caused redundant and often confusing work for the publishers. Going forward, this file will be auto-generated by the service. If your solution uses nested templates, scripts or extensions, those don’t need to change. At preview, we just had CLI support for creating a managed application definition for the Service Catalog. Now, we have added Portal and PowerShell support. With this, the central IT team of an organization can use portal to quickly author a managed application definition and share it with folks in the organization. They don’t need to use CLI and learn the different commands offered there. These could be discovered in the portal by clicking on “More Services” and then searching for Managed. Don’t use the ones which say “Preview”. 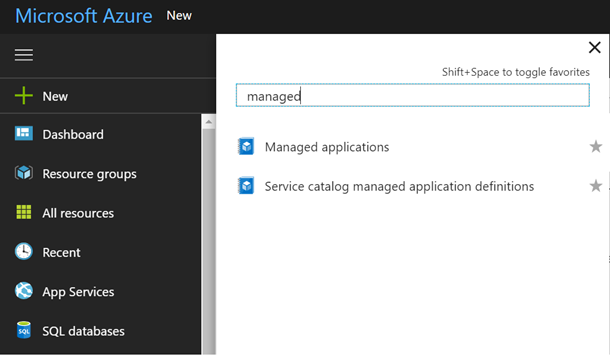 To create a managed application definition, select “Service Catalog managed application definitions” and click on “Add” button. This will open the below blade. Create a .zip file, uploading it to a blob, making it publicly accessible, getting the URL and then creating the managed application definition still required a lot of steps. So, we have enabled another option where you can specify these files inline using new parameters that have been added to CLI and Powershell. Support for inline template files will be added to portal shortly. Please note that the following major changes have been made to the service. The general availability release is introducing a new api-version which will enable you to leverage all the above mentioned improvements. The new api-version is 2017-09-01. Azure Portal will use this new api-version. The latest version of Azure CLI and Azure PowerShell leverages this new api-version. It will be required that you switch to this latest version to develop and manage Managed Applications. Note that creating and managing Managed Applications will not be supported using the existing version of CLI after 9/25/2017. Existing resources which have been created using the old api-version (old CLI) will still continue to work. The resource type names have changed in the new api-version. And so, Microsoft.Solutions/appliances is now Microsoft.Solutions/applications, and Microsoft.Solutions/applianceDefinitions is Microsoft.Solutions/applicationDefinitions. As mentioned above, to continue using and creating Managed Applications, you will have to use the latest version of CLI and PowerShell, or you can use the Azure portal. Existing versions of these clients built on the older api-version will no longer be supported. Your existing resources will be migrated to use the new resource types and will continue to work using the new version of the clients. Currently, the supported locations are West Central US and West US2. Please try out the new version of the service and let us know your feedback through our user voice channel or in the comments below.